There are a slew of brow products out there and it can get confusing especially to a complete beginner. The pencil, a majority favorite especially in the Philippines have other fast-growing competitors now. Namely, the brow gel/mascaras and brow powders. There are a few more types out there but let's just stick with these three. And these three can be found under drugstore-darling, Maybelline. 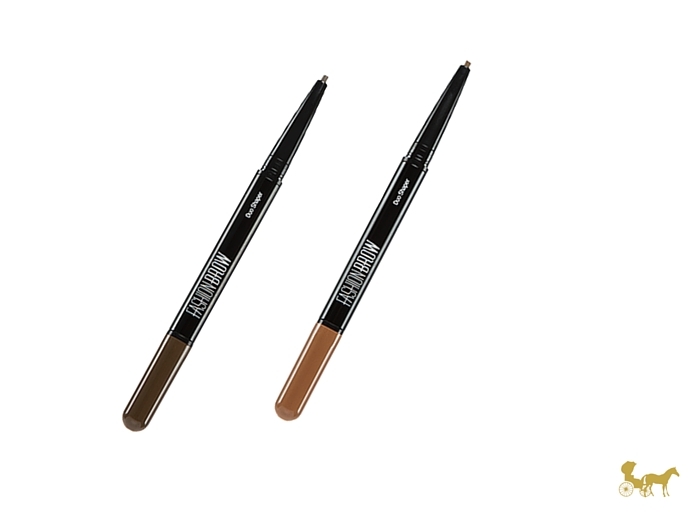 A twist-up slim brow pencil with an ultra-soft finish. Features a 2-in-1 oval head which allows for easy application. Lasts for 24 hours. Comes in Brown and Gray. The pencil is retractable as do all most Maybelline brow pencils. The lid snaps shut and won't have the tendency to accidentally open inside your bag. [same with the other pencil featured in this post] The twist-up is a little loose though. I have this pencil in gray, and while I think the colour is passable with my black hair I really hate this pencil. Harsh verdict yes, but let me elaborate. The pencil is a little soft and has a tendency to break if you're heavy-handed. Because of the texture and the slimness, I have snapped off at least 2 - 3 mm of said pencil while using it. The lead is a little waxy for my taste. It clings and tugs at my brows as I use it so I always see brow hairs at the tip of the pencil *boo*. Another problem I have with it is that it applies "crumbly" and patchy. Like it balls up as I apply it (naglilibag) and it drags a little. It's not the smoothest pencil out there. By the time I brush it out, since it clings more to the hair, I find bald spots where the pencil didn't stick to the skin. If I fill those spots in however, the brows looks too strong and by this point I could very well be casted as the next Live Action version of Rock Lee . One redeeming factor about this pencil is that it's hard to smudge. You really have to rub hard to get it to come off without oil and/or soap and water. Waxy pencils like this are used more if you want to lay down your brow hairs and keep them in place. For naturally defined and softer, fuller brows. Features a 2mm slim pencil and a similar coloured silicone powder at the other end. Comes in Light Brown and Brown. The brow powder on the other end has a sponge-tip applicator similar to an eyeliner smudger. It's soft and dispenses powder well enough. You dip it in the cap where the powder is located and tap it in a few times. To some people it may get a little tedious to tap it in the cap to get more product for each brow, but it's not a big deal for me. 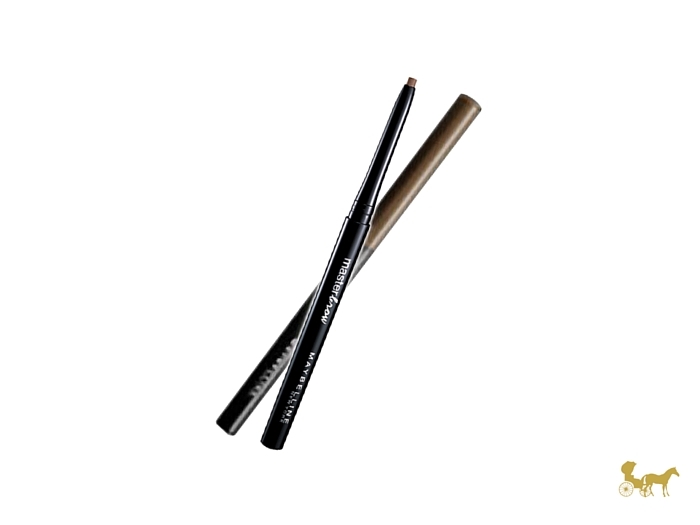 The finish and effect of this pencil duo is a more natural brow. Especially since I have it in a lighter shade. Apart from the obvious blonde-ish brow, you can't tell I have something on them. It's easy to draw "brow hairs" with the pencil tip and the powder helps set it in place. An all-in-one nose & brow palette, complete with a double ended brush. It features two brow powders and one wax. Marketed as a brow powder and nose contour in one palette, this multi-tasker is something I would pick over the two mentioned pencils. 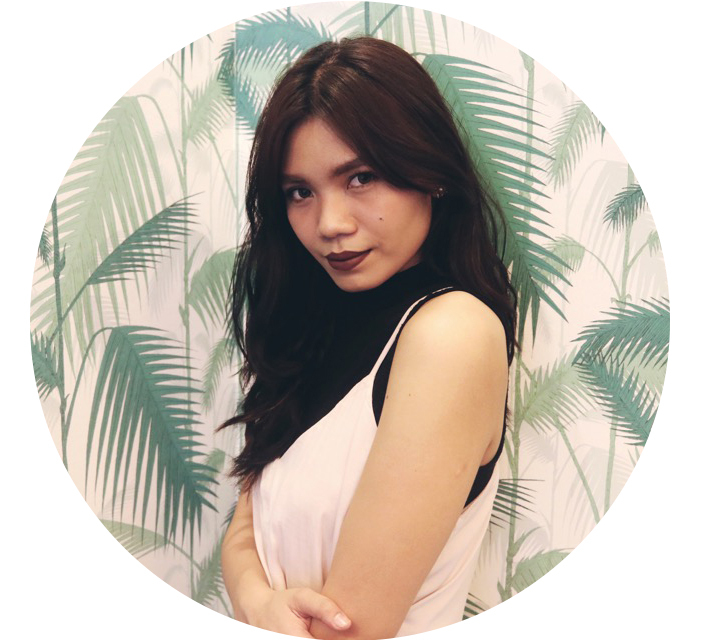 If only for the fact that I have more uses (hello matte shadows!) with this plus I don't pull out my own brow hairs. The packaging is plasticky and the lid shuts tight. Not the most sturdy but it's typical of most palette drugstore packaging. The wax is well waxy, sticky and creamy. Applied with a brush it doesn't pluck away my brow hairs unlike the pencils. 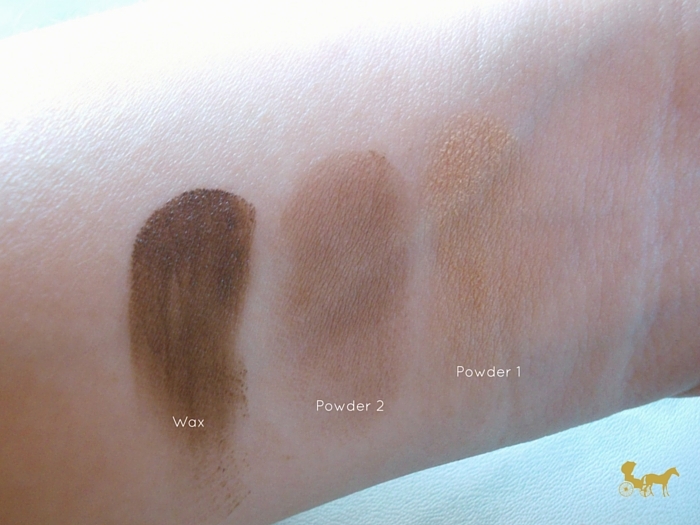 The two powders are smooth and pigmented but not overly so. You might think that's bad but these aren't really supposed to be as pigmented as eyeshadows. 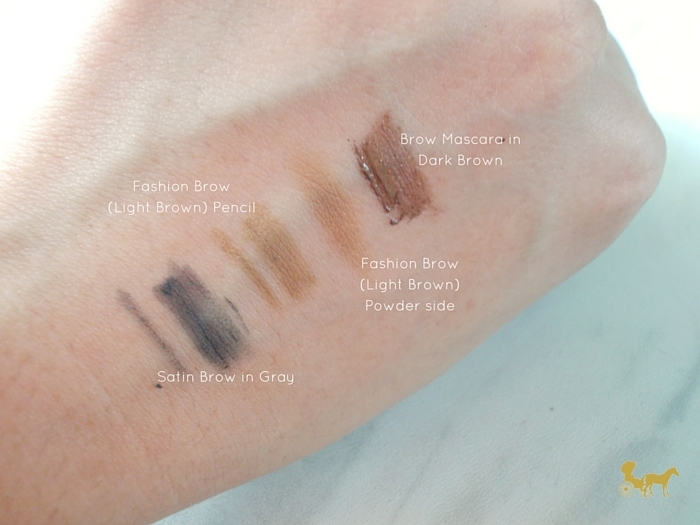 Brow powders are usually not-so-pigmented so it's easier to build-up and there's lesser chance to over-do them. The lightest colour in this dark brown palette is a nice light yellow-brown powder. This works best as the nose contour for light to medium skinned people. The second powder is a taupey medium-brown with a hint of purple and can look a bit red as a nose contour and as a brow powder by itself. The last colour is a dark chocolate brown wax. The outcome of this wax plus the darker powder yields a warmer brow colour. It's not ugly or weird against my hair colour per se, but I think I look better with cool toned dark brows. Cool toned brows look more natural against my natural hair colour. Note : There are slight differences between the Asian, US and Europe versions. The 3D palette feature a wax, two powders for brow and nose contouring and a double ended brush. The US release features a wax, brow powder, brow highlight, a spoolie/screw brush and double ended brush. The EU release features the same contents as the US without the spoolie/screw brush. Features an angle-free ball brush comb. A "Clump-free" brow mascara/gel that holds brows up to 12 hours. 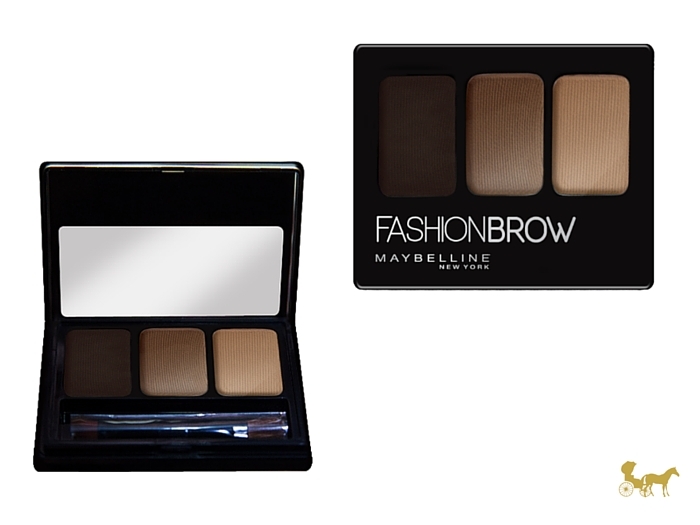 Gives brows a fuller look and natural colour. Comes in Dark Brown, Rusty Brown and Yellow Brown. I really like this stuff. The ball brush tip — a minesweeper doppelganger—can take some getting used to but the finish and effect it gives more than makes up for it. It holds my brows in place throughout the day and tints it as well as the skin underneath and makes it look full. Personally I can wear this without doing the pencil or powder underneath. I have it in dark brown and doesn't give me that red/orangey tinge. I have repurchased this already and I really like this better than the Nichido one. Get the Master Brow if you like waxy retractable pencils that hold your brows in place without the need for a brow mascara/gel. Get the Brow Shaper Duo if you want a powder to set your pencil with to make it look more natural and make it last longer (K-Palette has something similar). Get the 3D Contouring Palette if you prefer wax and powders that you apply with a brush. This palette has more versatility and control over how the brow looks. You get a nose contour and eyeshadows in a pinch as well. 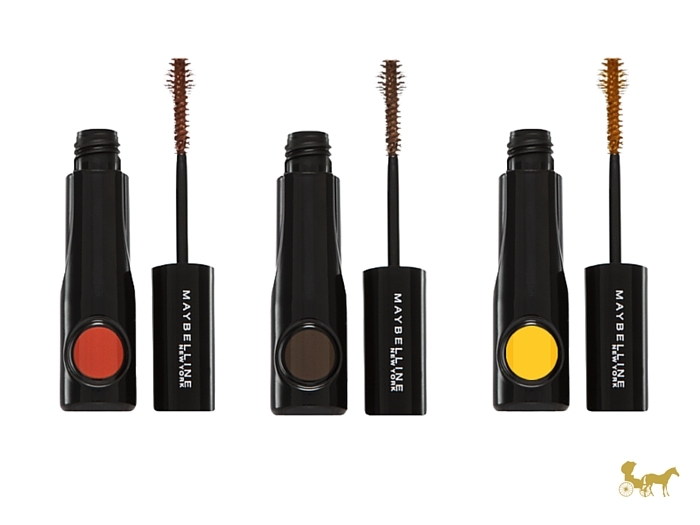 Get the Fashion Brow Mascara if you have full brows and just want to tint them a little and/or make them neat. You can also use this over brow powders and pencils to make it look more full and natural apart from keeping it in place. One thing to note about the pencils is that they are sealed in plastic when you buy them and all the information is on there. So when you lose that plastic (provided you can actually read the tiny condensed text) your shade colour, ingredients information, weight, manufacturing date etc are gone. I mean you can google them and shiz but ain't nobody got time fo' dat. But to be honest it's not on Maybelline's website. The Brow Palette isn't the best because the middle powder looks red on my brows by itself. The whole dark powder plus dark wax combo (or even just the wax) results in a warmer slightly unnatural looking brow because the hair on my head appears jet-black in comparison. It's workable but I wouldn't necessarily go out and buy it, if my hair were colored though I would definitely be singing a different tune. The Catrice Matt Palette works better for me because of the cool dark tones. As for longevity, they all lasted well throughout the day. Heat + sweat and all that jazz. The pencils fare a notch better than the palette under heat, sweat etc. I don't get too oily throughout the day so my brows stay pretty much intact (I do get really sweaty though). Have you tried any of these? Which one would you prefer to try? Disclaimer : These were given to me by Maybelline and Calyxta as a gift. 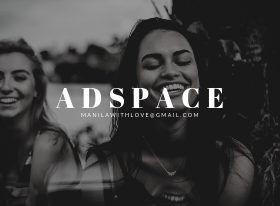 I was not paid/told/asked to write about or feature them in any way. 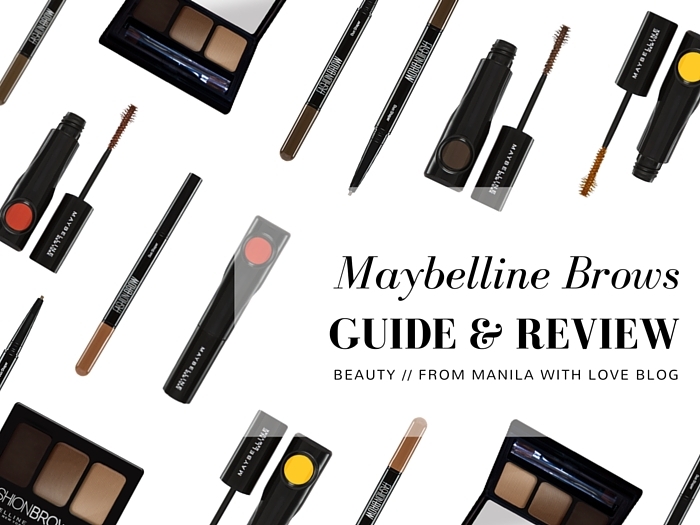 Product images courtesy of Maybelline.